Everyone made me laugh, but I still giggle every time I read Tracy’s caption. Tracy and Bob will each get a copy of George Orwell’s 1984. (Neither one wanted the music, darnit.) Come on back and write a review. I just finished re-reading it and would love to hear your reactions. Thank, Tracy and Bob, and thanks to everyone for playing! Write the best caption, win a prize! 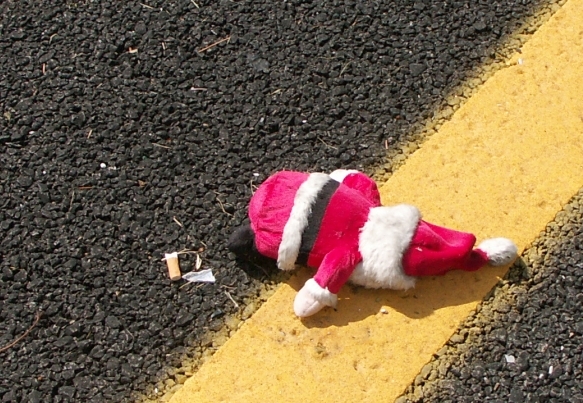 Back story: This little Santa has been in the street at one of my regular stoplights for about a week. The first time I saw it, I said out loud, “Santa is in the street.” Then my kids wanted to know why Santa was in the street. Today, they wanted to know why I stopped to take a picture of Santa in the street. Of course, I had no good explanation that translates well to 3- and 4-year-olds. But your caption doesn’t have to translate well to them. It just has to make me laugh.